If you’ve ever found yourself having walked in to a room and realizing you can’t remember why you’re there or if you’ve ever blanked on names, have had a hard time remembering where you left your keys, it may mean that you can benefit from using a brain booster. With so many different options available on the market, it can be hard knowing which is right for you. This Onnit Alpha Brain review is going to take a closer look at the facts and details to learn more about how this supplement works and to see if it’s worth trying out for effective results. 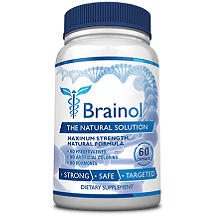 The manufacturer claims that their product has been clinically studied to help healthy individuals support memory, focus and processing speed. Other Ingredients: Cellulose, Water, Silica. L-Tyrosine is an amino acid precursor that works by helping the boost product L-dopa which is a neurotransmitter. Oat straw is an herb that relaxes you and can help manage stress. Pterostilbene is an antioxidant that helps reduce stress. Vitamin B6 helps synthesize amino acids and neurotransmitters. Cat’s Claw has antioxidant and immune-boosting properties. Bacopa has been found to improve memory. To help support enhanced mental performance, take two capsules in the morning or early afternoon, with a light meal. To help support an enhanced dream state, take a serving of two capsules 4-6 hours before sleep. Do not exceed three capsules in a 24 hour period. Talk to your doctor before taking this supplement if you are pregnant, nursing, are taking medications or have a medical condition. We were unable to find any associated side effects with this product. Onnit Alpha Brain is available to purchase directly from the manufacturer and from third-party retailers. One 90-capsule bottle costs $67.96. Onnit offers the option to subscribe to auto-delivery and receive 15%. The manufacturer offers a 90-day return guarantee. 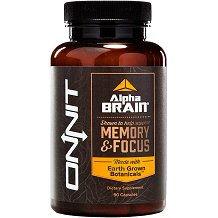 Onnit Alpha Brain appears to be a promising brain boosting supplement. Its ingredients have been shown to have the ability to support mental performance and it comes in easy to take capsules for convenience. However, while every person can have varied results from trying a supplement, we found most of the consumer feedback regarding Alpha Brain to be negative. Consumers reported that after continuously taking this supplement as instructed by the manufacturer, they did not experience any difference in their cognitive abilities. Others reported that it caused them to become drowsy or caused adverse side effects like headaches. Furthermore, the price per bottle is expensive especially considering that if does not appear that you get what you pay for you. The manufacturer also does not offer any discounted bulk purchasing packages to make it financially easier to afford to regularly take this supplement. With so many brain boosting supplements available on the market, you are better off choosing one that has been shown to have effective results and one that offers affordable purchasing options.